Less the host of the scroll air compressor parts , piston machine 1/8 , a key factor in a significant reduction of parts to improve the reliability . Small turning radius , the line speed is less than 2m / s , and thus low-friction , high mechanical efficiency . Piston , screw compressor compared to the lowest noise only 50 db . No smoke, exhaust valve eliminates the percussion sound of the valves and the explosion , so that the noise extremely lower .Suction and discharge is continuous and stable machine vibration small , small body size , small area , can be installed in any place , save a large amount of pipe and installation and management costs , and environmentally friendly performance . Because inspiratory booster effect and clearance volume , volumetric efficiency of the vortex air compressor up to 1 times or more , while the piston volumetric efficiency is about 70% , the lowest screw .No suction , exhaust valve, the resistance loss is almost zero , which is a scroll air compressor air compressor efficiency than other types of substantial energy saving of the main reasons . The novel host structure , fewer parts, no contact , precision difficult to damage , and replacement parts long life cycle , significantly reducing the possibility of replacement parts and damage . 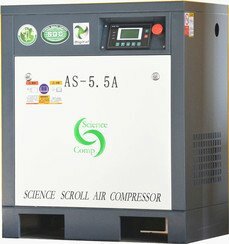 Failure rate is extremely low , very smooth running , because the parts linear speed less than 2m / s . Although the scroll compressor in the world only a few countries have , in this technically is very mature, models and more comprehensive , it is the best similar products to replace the piston and screw compressors choice. REQUEST TO REMOVEcircuito de internet!!! bastante bien!! !